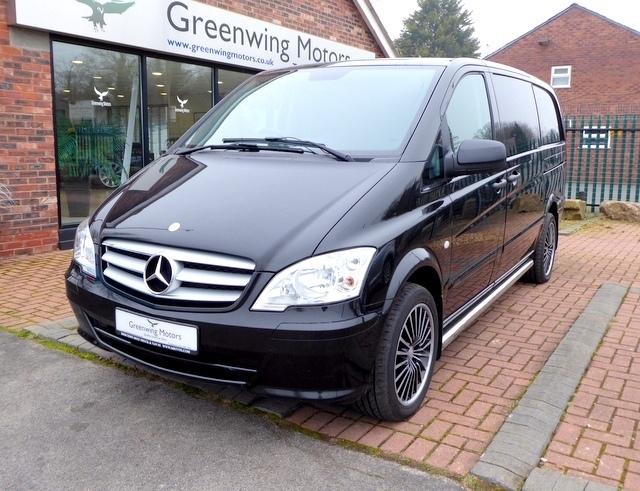 2015 Mercedes VITO 2.1 116CDI Dualiner (163) Compact Mini Bus Long Comi (EU5). 7 seats model. 77,000 miles with service history. MOT till January 2020. Hpi clear. Service records: 22,766 miles in 2016 in 2016 by Mercedes; 48,198 miles in 2017 by Mercedes; 71,078 miles in 2018 by Mercedes. Spec includes: Bluetooth phone prep; air conditioning; 7 seats; twin sliding doors with privacy glass windows; all 5 rear seats are removable; clip in floor table; towbar; CD / Radio / AUX with steering controls; electric windows; remote central locking; 18" alloy wheels. We offer low rate finance packages with no deposit option available. Price includes 6 months AA warranty package and 12 months AA breakdown cover. Part exchange low mileage vehicles considered, Viewing highly recommended. Please note we do charge an administration fee of £50.00 plus VAT on all vehicle purchase. To arrange early viewing and test drive, Please contact our sales team on 0161 9417322. We are close to M6 Junction 19 and M56 Junction 6. (Postcode WA15 0QW). For more pictures please visit our website www.greenwingmotors.co.uk £12,995 plus VAT.